Ready for use, solvent free, acrylic based primer with quartz aggregates. Fortified with improving additives. Distinguished for its strong adhesion, even on very smooth surfaces. It has excellent resistance to alkalis. It acts as moisture barrier, thus protecting the building from damage, without blocking its water vapour permeability (breathability). Necessary on surfaces where traditional scratch coat plaster adheres with difficulty, such as the surfaces of extruded or expanded polystyrene installed on building facades. Prevents possible detachments of plaster resulting from earthquakes and shrinkage of the insulating boards, due to the additional bonding conditions its application creates, on both interior and exterior surfaces. Ideal as primer, before applying D-6 cement screed, as part of the thermal insulation and waterproofing system for roofs, COOL ROOF. 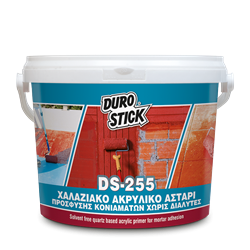 Also suitable before the installation of the microcemento (decorative pressed cement screeds), DS-250 and DS-254 IRON onto existing tiles, marble or mosaic. Apply on marine grade plywood floors and thoroughly cleaned sheet metal, before applying DS-252 FLEX decorative pressed cement screed. 300-350gr/m2 per coat, depending on the coat thickness and substrate.